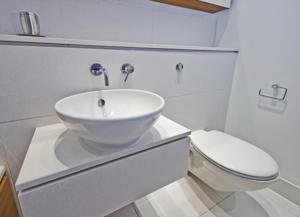 Bathrooms are one of the most frequently-used rooms in your entire home, and if you live in an apartment, chances are your quarters are a bit cramped. Even with a dearth of space, you still have plenty of design options and bathroom accessories at your disposal to create a lively, everyday space, according to Better Homes and Gardens. There are some small craft projects you can undertake to make common additions stand out even more. If you have a large shower curtain around your bathtub, take a weekend afternoon and decorate the sides of the material with beaded edging. This will add a pop of color to your washroom that you can pair with matching towels, soaps and candles. Your bathroom vanity is another important consideration, so try to look for a design that can match the look of your furniture around the house. For instance, if you're using a lot of eclectic furnishings in your living room, you don't want to go traditional in the washroom. Keep your theme consistent to create an attractive layout for your entire apartment. Apartments come with their own unique design challenges, but keeping things uniform and sprinkling in a bit of your personality will certainly help. How have you made your apartment bathroom stand out?